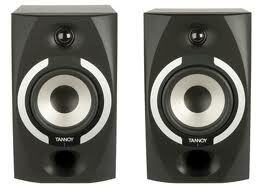 The Tannoy Reveal 501A Studio Monitors are excellent for the price. The 5" woofer and 1" tweeter bring out a really clear sound. They are built extremely well and will blow your mind. They are meant to be used for near-field mixing and monitoring. The day I bought these, I tried a recording session with some new songs I had written the night before. I was impressed with the response and clarity. They can get fairly loud too. Tannoy is a trusted company so you be sure you will receive a good product. They are priced at $155 each at Guitar Center. Click the link below for an exclusive deal.